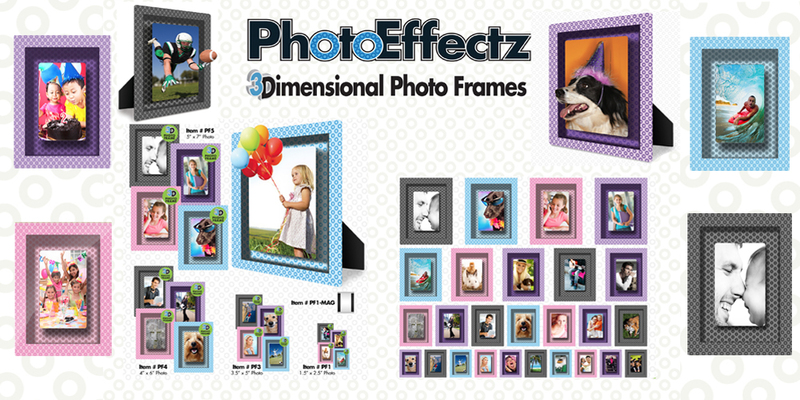 Our PhotoEffectz frames feature the very latest in lenticular technology to give you the impression that your pets and loved ones are floating in thin air! 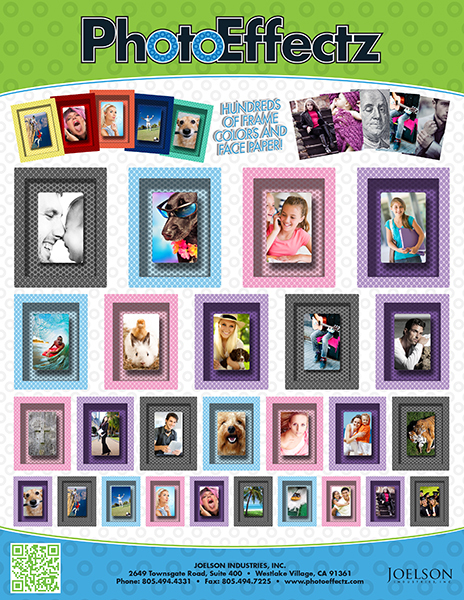 This exciting picture frame concept creates a 3-D effect when a picture is inserted into the frame. The optical illusion sets the picture back into the frame and it looks like the picture is floating as it sets back 6 inches in a frame that is only 1/4" thick. Now you can bring a whole new dimension to your memories! 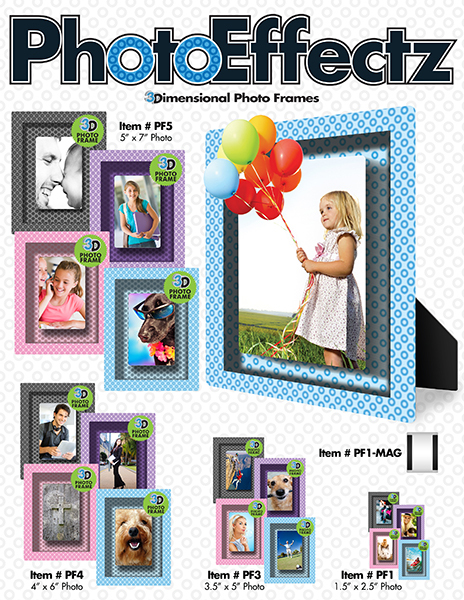 Features two contrasting 3-D patterns * Display photos vertically and horizontally * 100’s of face paper varieties to choose from * Multiple merchandising options available * Assorted colors! Bring a new dimension to your memories! The PF1-MAG will add a new dimension to any photo! Features include a magnetic backing that is ideal for school lockers, refrigerators or any metal surface. Product ships with a peggable header card for versatile merchandising options. The PF1 will capture your treasured moments and display them in 3-D! Features include a decorative metal easel post that allows you to display your photos vertically or horizontally. Product ships with a peggable header card for versatile merchandising options. A great desk accessory! 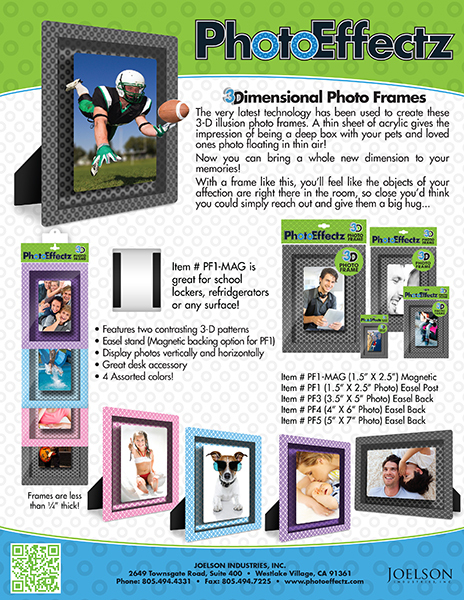 The PF3 frame is perfect for showing off your favorite photo in 3-D! The easel back with wall hanging hooks allows you to display your photos vertically and horizontally. Great desk accessory and gift! Product ships inside of a protective peggable PVC bag that can be removed for displaying at retail. The PF4 will make you feel like the objects of your affection are right there in the room, so close you'd think you could simply reach out and give them a big hug! Each PF4 frame comes with an easel back with wall hanging hooks so you can display your frame vertically and horizontally. Product ships inside of a protective peggable PVC bag that can be removed for displaying at retail. The PF5 frame features the very latest technology to give you the impression that your pets and loved ones are floating in thin air! The easel back with wall hanging hooks allows you to display your photos vertically and horizontally. Product ships inside of a protective peggable PVC bag that can be removed for for displaying at retail. 4 assorted colors! In partnership with our customers, our designs are driven by creativity, functionality and retail price. Besides creating and manufacturing our own brands, Joelson Industries utilizes several warehouses to better service our customers’ needs. This streamlines the procurement process and retailers can enjoy the savings of lower retail price points and healthy margins by removing the unnecessary costs. It is in Joelson Industries DNA to surf the wave of trends and technology in the creation of our products. It is our passion to live and work on the cutting edge of inspirational and aspirational marketing! Innovative ideas and unique messages delivered through creative mediums render our brands and products unforgettable. Our brands incorporate revolutionary technology and cutting edge design elements that redefine industry conventions. What makes us so special? Over the past 26+ years, we've built a unique business model that can service all of your organization's needs, whether you’re a small, growing business that requires a drop ship program or a member of the Fortune 500. Since 1988, the world's leading retailers have trusted Joelson Industries, Inc. to provide them with an array of quality and exclusive programs with top notch service to make your job easier. Our dedicated Account Teams bring you new and unique products more quickly than you ever thought possible along with the service & accuracy you can expect from an industry leader. Nobody else does it quite like us! Looking for more information regarding Photo Effectz or another Joelson product?